I love the way a quick browse on Pinterest can open up a whole new world in an instant... that was the case recently when I was led to Mayumi Origami Accessories. 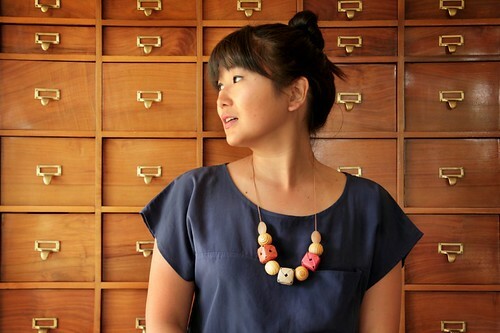 Renata Mayumi folds small squares and rectangles of decorative paper to make modern jewelry. Lovely Renata Mayumi is of Japanese descent, born in São Paulo and currently lives in Lisbon, Portugal. 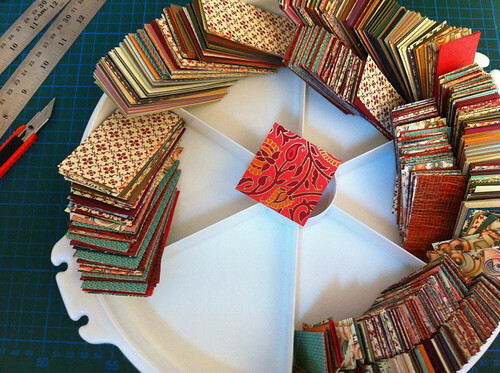 She has been a direction assistant in the television and film industry for the past nine years and began selling unique paper creations via craft shows in 2012. Please tell us about the launch of your origami business. Mayumi Origami started as a delightful hobby! After watching many tutorials and practicing hundreds of diagrams, as a self-taught Origami Artist I’d finally taken the initiative to create my own pieces. 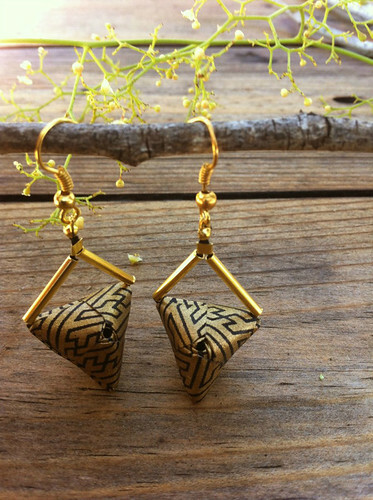 In the beginning, what really caught my attention was the challenge to adapt origami structures to jewelry and home decor accessories in an unseen and original way. But later on, trying to find the perfect paper was also a very exciting task. To combine fashion trends with the exact textured and patterned paper has definitely been a challenging mission, but I love it! 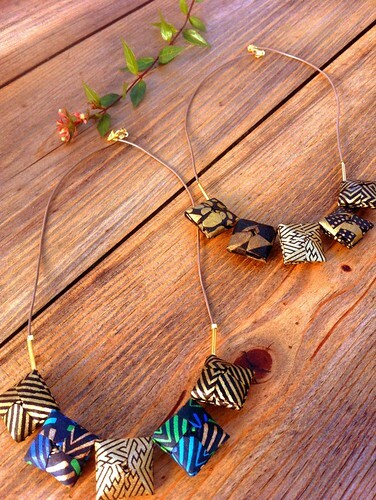 To make her sophisticated jewelry, Renata Mayumi uses colorful papers from Italy, Portugal, Japan, India, and Korea. 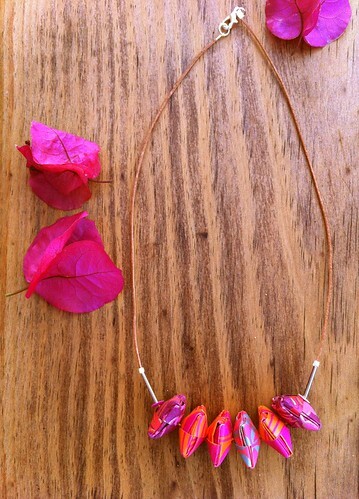 She coats each piece with a lacquer finish that repels water. 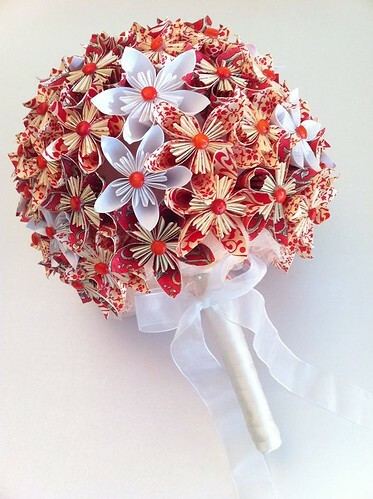 Renata Mayumi also creates contemporary home decor and wedding accessories, such as battery-operated lotus candle holders and this beautiful bridal bouquet. The white kusadama flowers are striking accents against patterned papers. What do you especially enjoy about working with paper? The greatest things about working with paper are definitely the flexibility, the delicacy, and the unique touch of it. Handmade papers from India and Nepal with an Oriental gold touch and organic patterns are no doubt my favourites. They are just perfect for my projects! 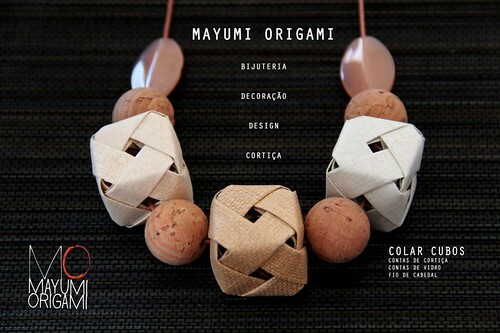 What are your future plans for Mayumi Origami Accessories? Love love love her work!!! Beautiful! Renata, these are all so gorgeous! Thanks so much for sharing with us. Beautiful work; the earrings caught my attention especially. Couldn't be more satisfied with all your kindness and support. It really makes all the difference :) Will push even harder on my next projects, thanks to all of you!!! 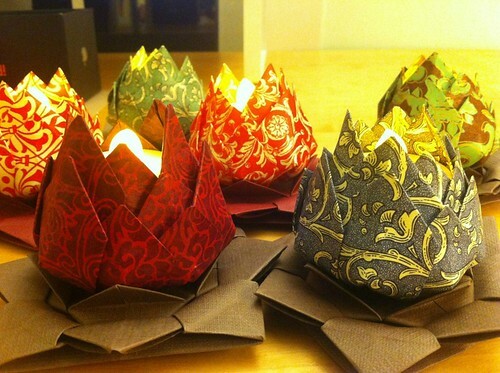 Brilliant colours and so beautifully folded!! 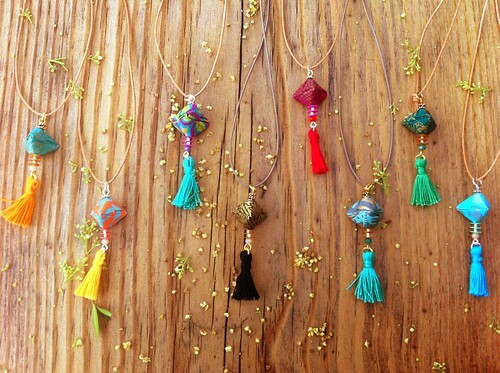 Love everyone of these origami jewellery. I was honored to meet Renata recently at Estrela Garden's craft fair and got her beautiful black & gold origami necklace which I will treasure! Her work is meticulous and delicate, thoughtful and zen! Thx for this article about her! How nice of you to visit and leave a comment, Eleanor. I completely agree with you about Renata's jewelry... I am a huge fan also. Lucky you getting to meet her and see all of the pretty choices in person!